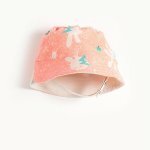 A Summer essential is this sweet little sunhat for babie. 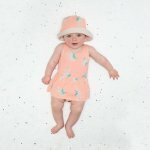 Now you and your little one can go out and about, enjoying that summer sun and relax knowing that their head is protected from the heat. This hat features a "Bowie Bunny" vintage print and a chin strap with press studs to stop it falling off and getting lost.